Joe Paddock, Keeper of the Wild: The Life of Ernest Oberholtzer. Minneapolis: Minnesota Historical Society Press, 2001. Cloth. Illus. 322 pp. ISBN-0-87351-409-2. There are some individuals in whom modesty, confidence and curiosity cohere in such a way that, despite their achievements, the nature of their interior life remains something of a mystery. Where such a person makes a mark on the world it often falls to somebody else to try and sort it all out. This has been the enthusiastic enterprise of Joe Paddock with respect to Ernest C. Oberholtzer (1884-1977), the influential conservationist of the region between Grand Portage on Lake Superior and Lake of the Woods, the so-called “boundary waters” area. It is a happy choice, for Paddock is also a poet and possesses the sensibilities required for gauging Oberholtzer’s rich, but somewhat ambiguous, personality. The biography has been constructed from Oberholtzer’s Journals, occasional writings and from extensive tape interviews given in his later years. Divided into three sections, the first details his early years; the second, his years of political advocacy; and the third, his later life spent at his Mallard Island retreat on Rainy Lake. Just what Oberholtzer’s qualifications were for his role as wilderness advocate is revealed in part two; but the roots of his involvement stem from the first in which his great adventure to the Barren Lands of the eastern Arctic are described. Oberholtzer’s life is an extraordinary one, but also a mystifying one, for he was a private man who left relatively few literary tracks. Oberholtzer was born in Davenport, Iowa. On the strength of his Grandfather’s estate, he went to Harvard in 1903 where he rubbed shoulders with some of the brightest men of the day, including the philosophers William James and Georges Santayana. He studied landscape architecture with Frederick Law Olmstead, and received excellent training in music. His violin always accompanied him, even into the northern barrens of Canada. At Harvard, he befriended the young poet, Conrad Aiken and Samuel Eliot Morrison, both destined for greatness. “Ober”, as he was nicknamed early, was always prepared to take the lead in promoting some ramble in England or Europe, accompanied by one or more of his somewhat retiring chums. He moved in refined circles and became accustomed to well-to-do friends looking after the bills, (which they did willingly) a habit he does not seem to ever have completely dropped, allowing him to pursue for most of his days a rather patrician sort of life, often in the absence of fixed employment. With time, his friends settled down in their own way, but Ober kept on rambling. During his senior year at Harvard, 1906, he made his first trip into the Lake Superior country. This was a response, perhaps, to those childhood Mississippi musings when he often wondered about the source of the great booms of timber which came floating down the river from the north to Davenport. “Ober kept a journal of his baptismal trip by canoe into the boundary waters” on which he was led by Ojibwe (Anishinabe) guides. The rough and ready ways of life north of Ely opened Ober’s eyes to social reality. The journal’s contents “reveal hints of grim humor over his predicament” but “also excitement and a deep appreciation for the world he was discovering.” These entries give the first suggestion that wilderness would win out over the city in the battle for his fixed attention. Ernest Oberholtzer paddling in the Rainy Lake area. Between 1909 and 1912, Oberholtzer spent a good deal of time travelling in Europe, toying with adventure journalism, and above all else, reading first hand exploration accounts in the British Museum. “I looked up everything there was on the Barren Lands.” There was not a lot, but he gave close attention to J.B. Tyrrell’s Geological Survey Reports of the early 1890s, by far the richest source on the eastern barrens. There was a large area north and east of Nueltin Lake which even Tyrrell had not visited, a zone dominated by the Thlewiaza River which eventually took one out to Hudson Bay well north of Churchill. Oberholtzer’s mind had, by 1911, been taken over by the exploration literature, somewhat in the way Don Quixote’s had been taken over by the literature of medieval romance. The time was ripe to become a “knight errant” into the wilderness. From their departure from the railhead at the Pas until their arrival at Churchill, there were many who told them they were mad, or at least thought it. At Cumberland House they were met by H. M. S. Cotter, who was the HBC post manager, not a boat. He seems to be the only one who entertained a positive view of their projected enterprise. The first stages north were relatively social as they moved along active fur trade routes with regular company. As they entered the deadly terra incognita they would have little to guide them except one of Tyrrell’s sketch maps, and it was starting to register upon the two men that they would not have time to follow Tyrrell’s route up to Baker Lake but would have to move east through lands few had seen since the time of Samuel Hearne. Over fifty years old, Billy MaGee now played the Sancho Panza to Oberholtzer’s Don, and while he was much more practical in his attitudes, we learn about him mainly through Oberholtzer. In his way, he is surely as intriguing a figure as Oberholtzer himself. With or without Billy’s approval, Oberholtzer tilted at wind-storms and charged herds of caribou with his camera, and then pushed onward into the greater unknown. The record of the Journal is astonishing in the true sense of the word. Luck and the assistance of Natives on the land help explain their survival. When they reached Gimli in early November, after racing the winter clock against a rapidly-freezing Lake Winnipeg, Oberholtzer’s creed might well have become that of Blanche Dubois in Streetcar Named Desire: “I’ve always relied upon the kindness of strangers.” The experience was formative for both men, although Billy’s wife would keep a close eye on him in the future. No more Sancho Panza roles! Few people had been where they had ventured, and the photographs, which miraculously survived, are an important legacy, several being reproduced in the book. It would be another decade before members of the Fifth Thule Expedition started to put together a public picture of the harsh traditional way of life of the inland “Caribou Eskimos” of that quarter. Oberholtzer tried his hand at various occupations after his return. By 1915 he was committed to living on Rainy Lake. Over the next twelve years he became increasingly concerned about the dam-building ambitions of Minnesota lumber baron, Edward W. Backus (1860-1934). The International Joint Commission had already made a Reference ruling in 1912 with respect to Lake of the Woods levels. A second Reference of 1925, concerning the question of whether or not the Rainy River Watershed should become a storage basin for industrial waterpower, came down in favour of those who backed the status quo. The opponents of such schemes did not take this as a permanent victory however, for Backus was a political in fighter of the first rank, well-connected in state and federal politics. 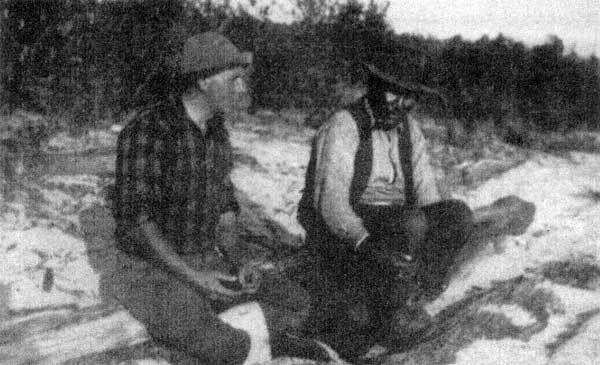 Oberholtzer and Billy Magee at camp during their 1912 canoe trip to Hudson Bay. Oberholtzer’s reputation started to develop after 1927, when he became the first Chairman of the newly formed Quetico-Superior Council. Much of the region already enjoyed special land protection status owing to the establishment of the Quetico Park reserve in Ontario in 1909 and the complementary Superior National Forest on the Minnesota side, also set aside in 1909 by Theodore Roosevelt. Such land reserves were rather loose arrangements however, and did not preclude road building and resource exploitation applications. At the time of these large land reservations, Backus had already completed construction of a major dam at International Falls, across from Fort Frances, on behalf of his growing Minnesota and Ontario Paper Company. 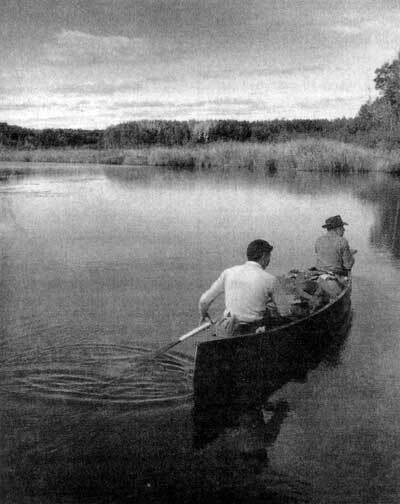 The story of Oberholtzer’s role, and of his many associates, in the growth and conduct of the wilderness lobby, is well described by the author, augmenting other more detailed accounts found in R. Newell Searle’s, Saving Quetico Superior, Robert Treuer’s Voyageur Country, and the recent biography of Sigurd Olson by David Backes. The first great success of the lobby effort came with the passage of the Shipstead-Nolan Act in 1930, the effect of which, in Oberholtzer’s words, were two-fold: “to forbid the logging of federal shore lines and to forbid, except by consent of congress, the alteration of lake levels affecting federal land.” Given that flooding action in the boundary waters were bound to affect Canadian waters, any such activity envisioned by Backus, would also be subject to challenge under the IJC. Backus knew this. He was a major employer on both sides of the border and he lobbied in Toronto and Winnipeg just as hard as he did in St. Paul and Washington. He had built many new plants since the mid-1920s and with the successful passage of Shipstead-Nolan, he put new pressure on State politicians and the IJC. He lost his final battle in 1934 after a Minnesota version of Shipstead-Nolan was passed and when a long anticipated report of the TIC did not provide any firm policy recommendations favourable to Backus. He died that same year, his over-expanded industries in shambles owing to the depression. Shipstead-Nolan was important legislation, one that set precedents which would later show up in The Wilderness Act of 1964. The greatest legend was his own on the barren lands. As with the young man in Conrad’s Youth, he never quite got over it. He regretted his failure to write the trip up properly, but with the passage of time, perhaps the truth of the episode became too valuable, something carried within himself (like his soul), not to be exposed too readily to the world. It may be too, that the sheer audaciousness of the venture, the personal hubris involved in affecting such a direct confrontation with the gods, might have required him to reveal its more embarrassing aspects if he were to write it up honestly. In 1963 he did make a return trip to the barrens. Billy Magee had long since died, but he went in with his young “violin-playing” friend and canoe companion, Bob Hilke. Interestingly, the expedition seems to have been only marginally less-chaotic in its execution than the first. But like all such trips taken by old men to earlier theatres of action, he was not looking for the barren lands this time. He was searching for the young Ernest Oberholtzer. 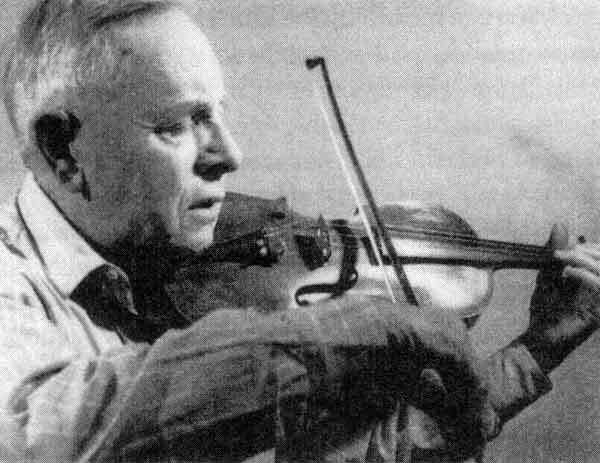 “And late at night I fiddle a little.” In his later years Oberholtzer liked to relax with his violin and bore a resemblance to the great Isaac Stern.